Is The China Bubble Starting To Burst? We’ve just seen the Rudd Government present a truly fantastical budget. One that relies completely on the hopeful fantasy that the Chinese building boom will continue for a decade to come, and so, a “great big new tax” on the “super profits” of mining companies can return the budget to surplus. But what do professional strategists on the China economy have to say about China’s prospects? China’s economy is teetering on the edge of a major slowdown … according to a noted China strategist. David Roche, an economic and political analyst who manages the Hong Kong-based hedge fund Independent Strategy, says the world’s third-largest economy is now on the brink, faced with the inevitable reckoning that follows an extended bank-lending binge. “We’ve got the beginnings of a credit-bubble collapse in China,” said Roche, predicting the economy will likely cool from its stellar double-digit growth rate to a 6% annual expansion as a result. While that may not sound bad, Roche believes the collateral damage from the cooling will be anything but mild, as the banking sector comes under pressure from cumulative years of bad investment and mispriced capital. The emerging picture is one of a substantial contraction in credit growth and infrastructure expenditure, he says. The shrinkage is grim news for an economy heavily dependent on such outlays. China managed to escape recession during the global crisis mainly because of bridges, railways and other infrastructure-project spending, estimated to have accounted for about 90% of economic growth last year, according to Roche. About 85% of the funding for these projects was arranged by local government financing vehicles “borrowing money they can never repay” from state-owned banks, says Roche. Nearly 3 trillion yuan ($440 billion) of the 11 trillion yuan extended to these entities has been wasted or stolen, he estimated. More worryingly, as bank lending dries up, there won’t be the firepower to sustain new investments in infrastructure, eroding a core pillar of China’s growth model, he said. Much of the focus on potential asset bubbles in China has been on the property sector, but Roche suggested that housing-price inflation is intertwined with unsustainable gains in other areas. A slowing Chinese economy could also have ramifications for the resource sector. A scaling back of the infrastructure-building binge is negative for industrial commodity prices such as copper and iron ore, with the latter potentially slumping 50%, he said. “I would not own resource stocks,” Roche said. Iron ore prices to fall by 50%? Hmmmmm… any guesses what that would do to the “super profits” of mining companies? And to the “great big new tax” that Rudd Labor is relying on to get the budget back to surplus? 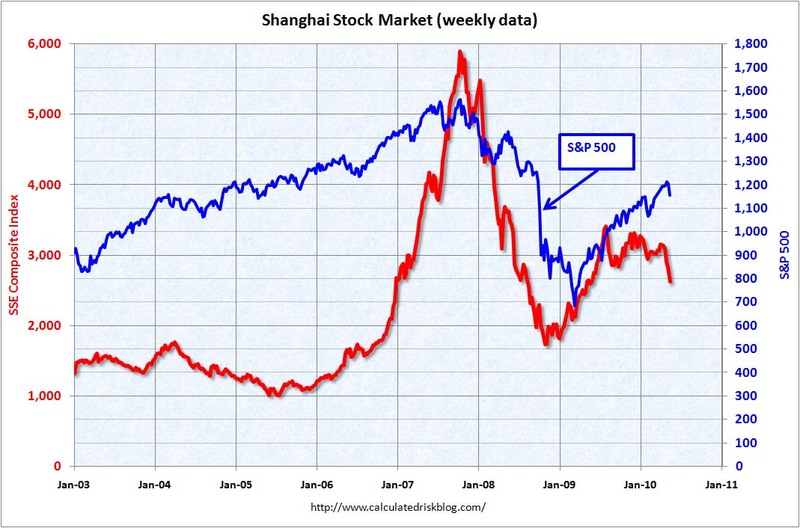 Keep an eye on the Shanghai index (in red). It appears China’s economy is slowing.